Self Expression to Inspire and bring Joy. 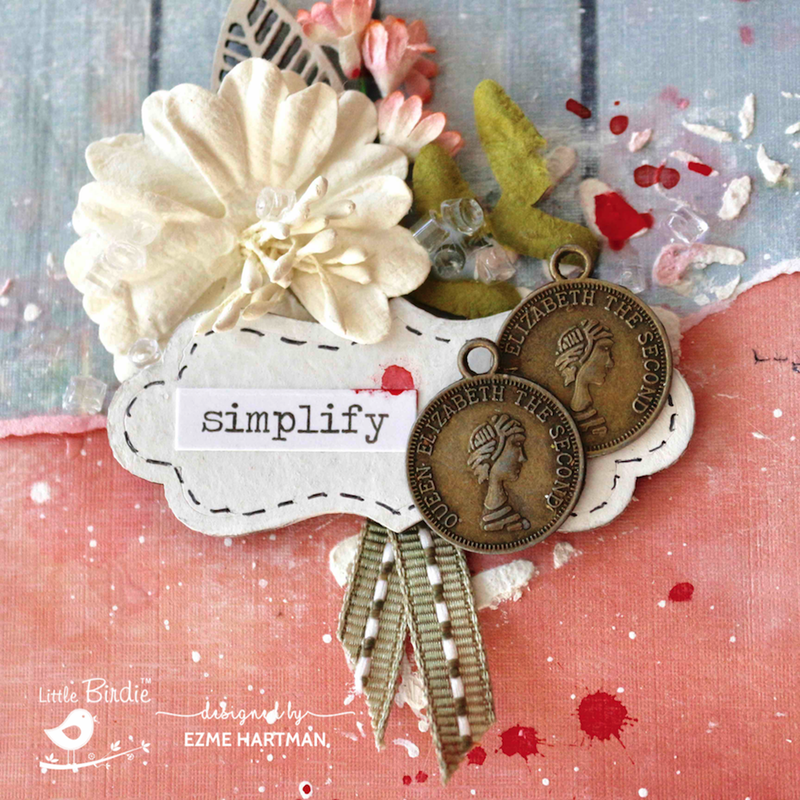 I'm back again on the Little birdie Blog with another layout. 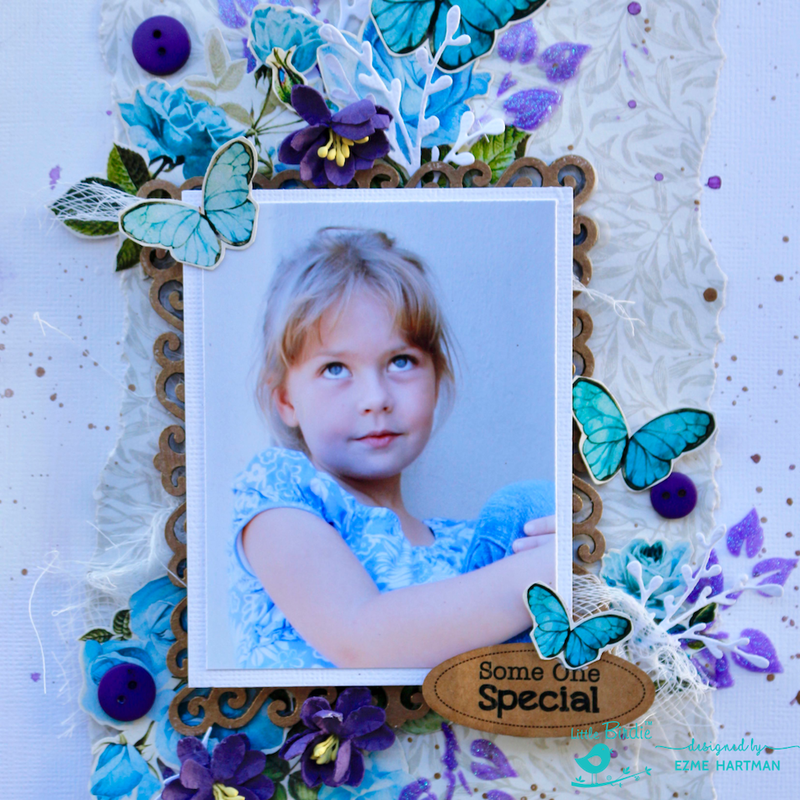 I love creating layouts and this photograph of a friend's daughter is so cute, it just begged to be scrapbooked! 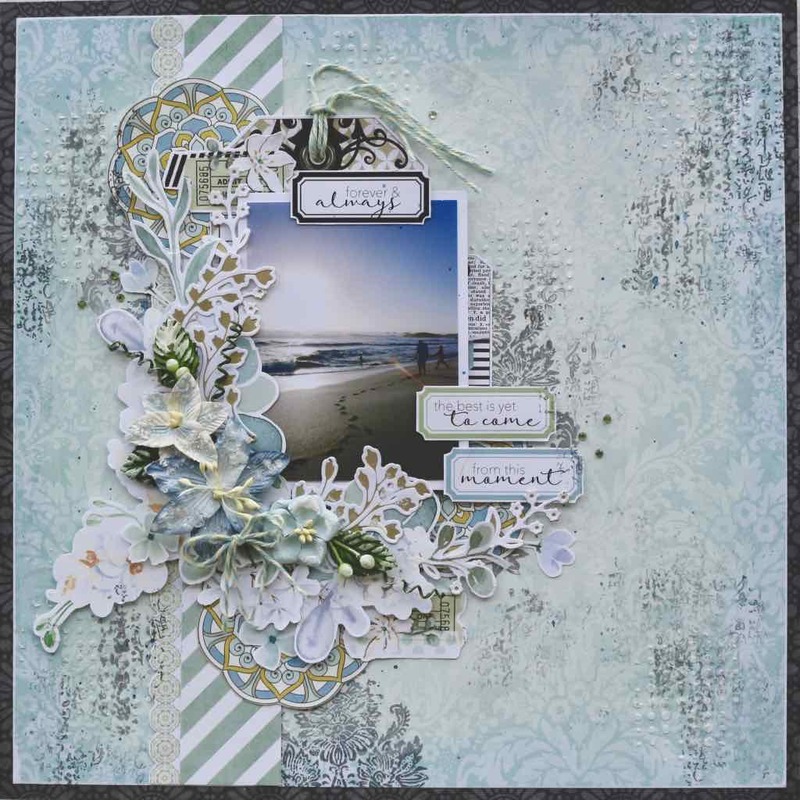 I fussy cut some elements from the Aqua Medley paper pack. I love the roses and butterflies. 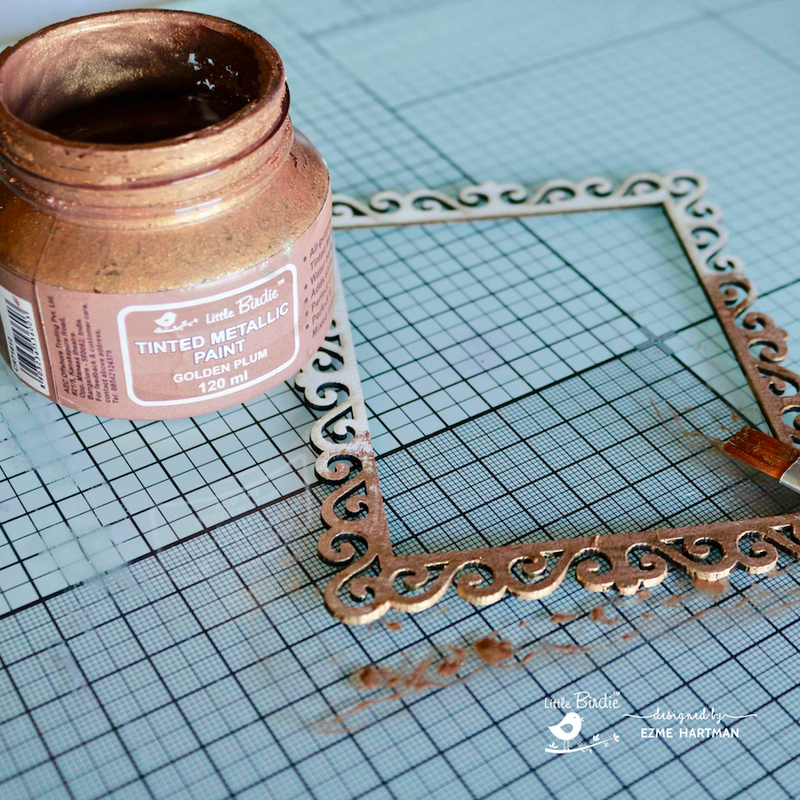 Golden Plum Tinted Metallic Paint is one of my favourite Little Birdie products, I used that to paint the Chipboard frame. 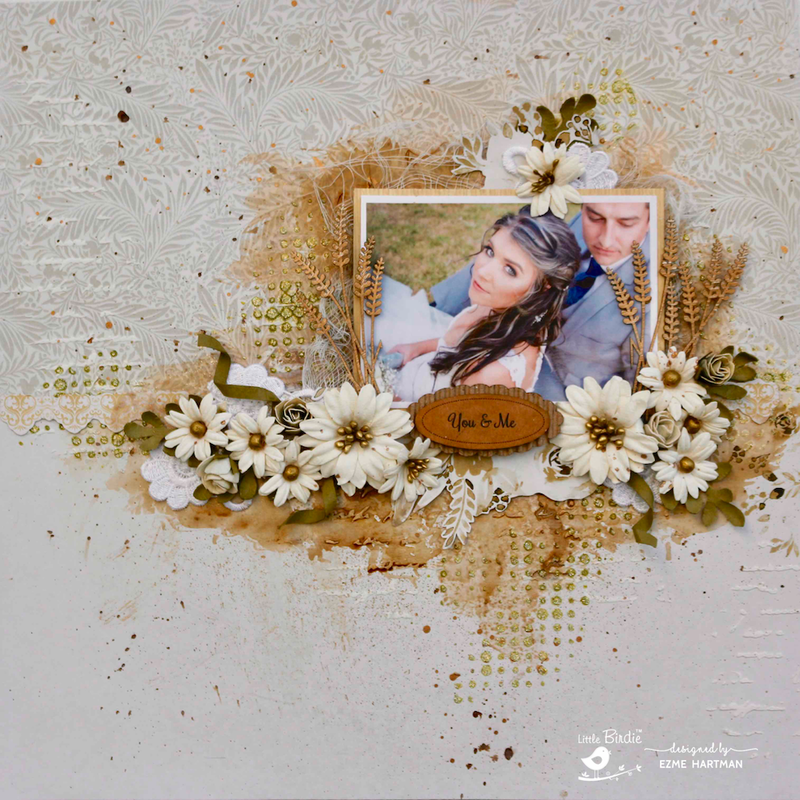 For the background I used white card-stock and patterned paper from the Amor Mio collection. I tore a strip and adhered it to the white card-stock. 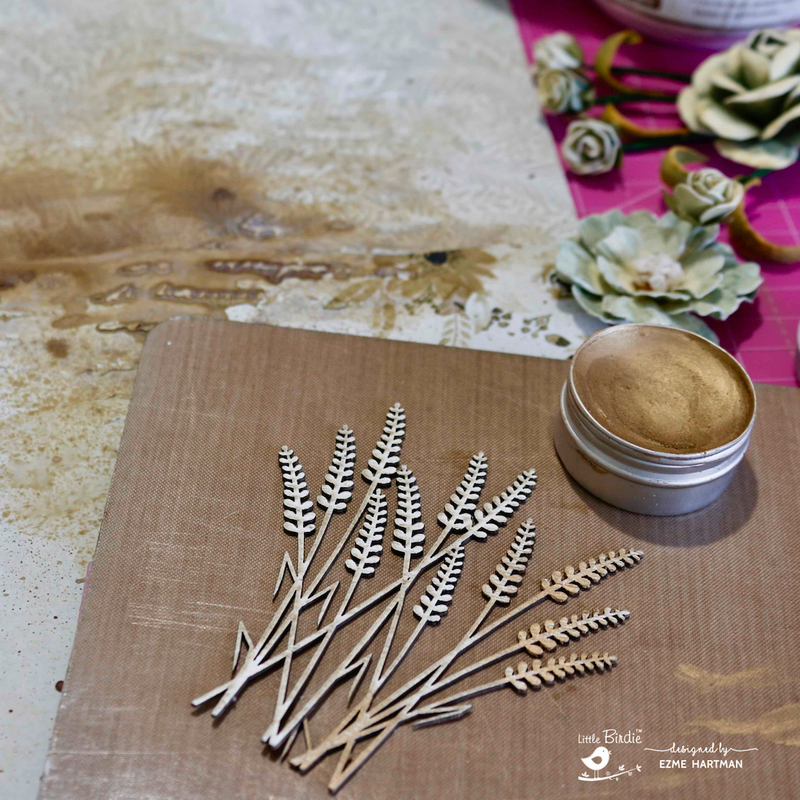 I stencilled a few leaves randomly with Mulberry Glaze Sparkle Paste and splattered with Colour Splash and Golden Plum Tinted Metallic Paint. 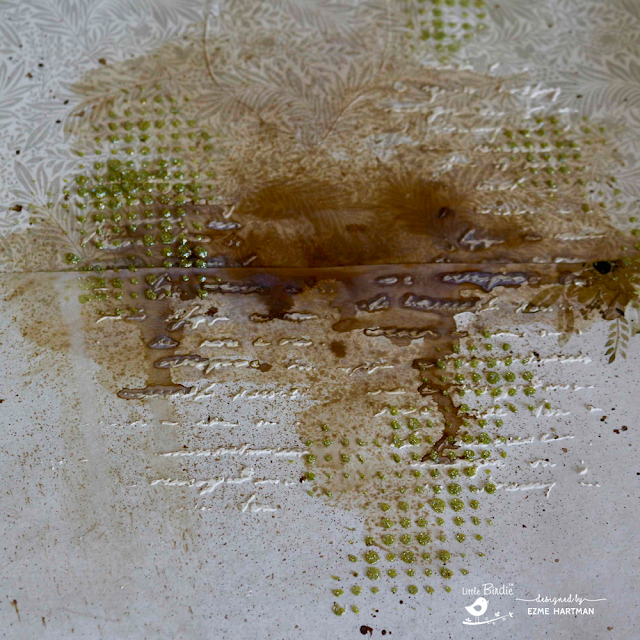 I then adhered a piece of Cheesecloth and placed the frame over it, but a little off centre. 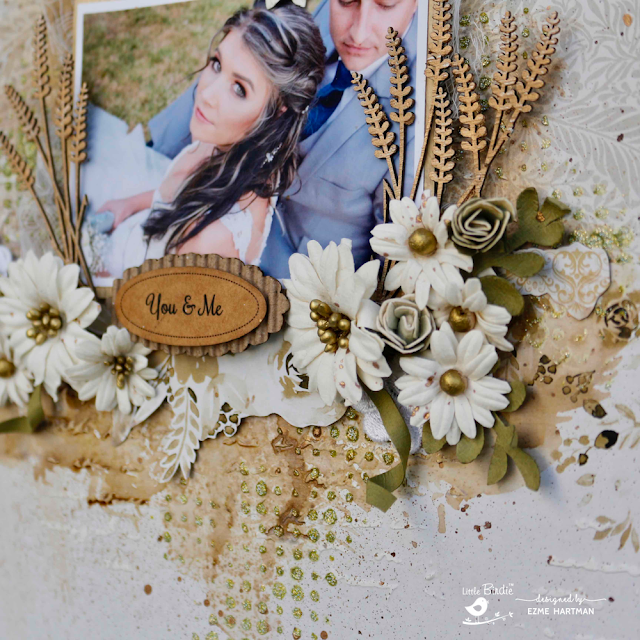 The fussy cut flowers and some die cut leaves were tucked in behind the frame. Next I added the photo, I first raised it on a small piece of cardboard. Then I added flowers and buttons to create more interest. Happy creating until next time! 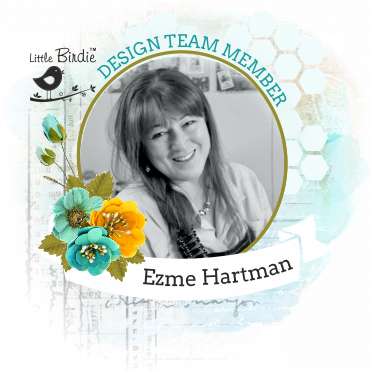 I'm honoured to be back again on the Little Birdie Design Team for 2019, and very excited to be working with these super talented designers. Thank you for all your support and comments, I really appreciate it. 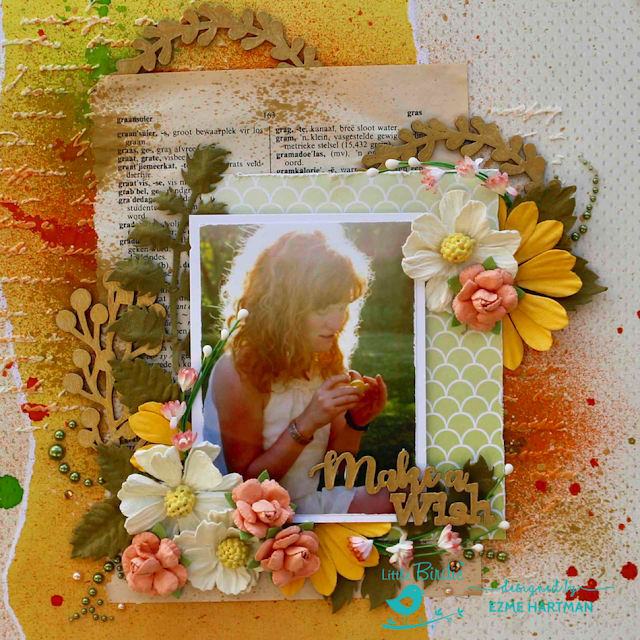 I LOVE creating scrapbook pages and decided on a single page, mixed media layout for my first project. 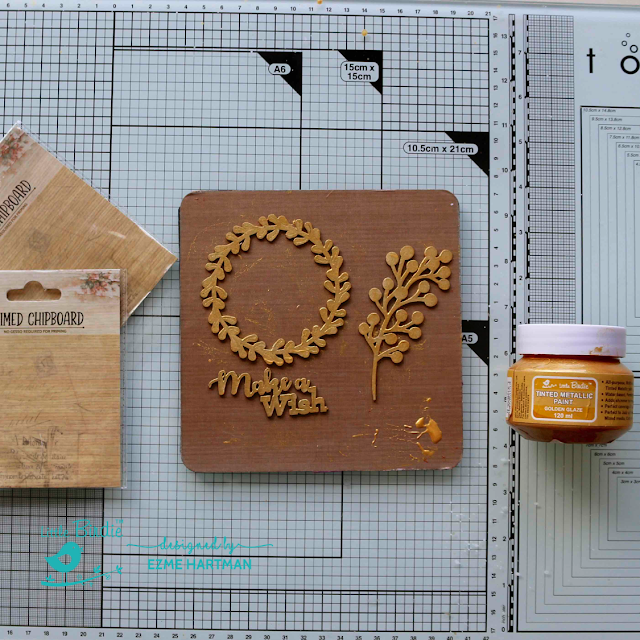 I wanted to use as much of the awesome Little Birdie products as possible! To create the background of the layout I used the Amor Mio paper collection. 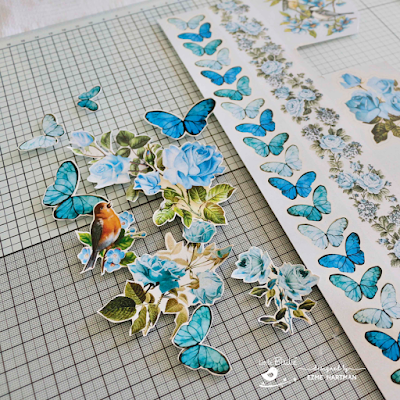 I cut the pattern paper with the flowers in half and fussy cut the flowers on the piece that I didn't use. 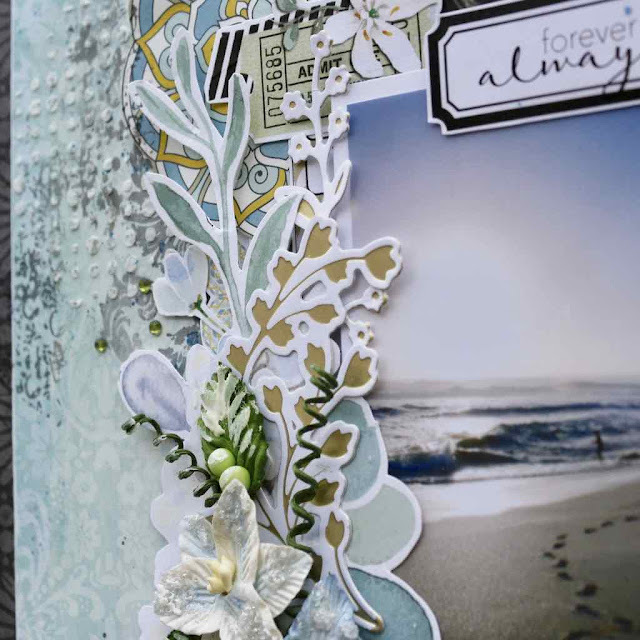 I stencilled with LB Mixed Media Paste and the Script Design stencil randomly across the page after I adhered the piece with the flowers on the "leaves" patterned paper. To add more texture and interest, I sprayed Mocha Color Splash and stencil with the Silver Sage Sparkle paste and the spotty stencil. I also splattered with the Mocha Color Splash and diluted Tinted Metallic paint: Golden Plum. I absolutely adore the delicate Grass Primed Chipboard! 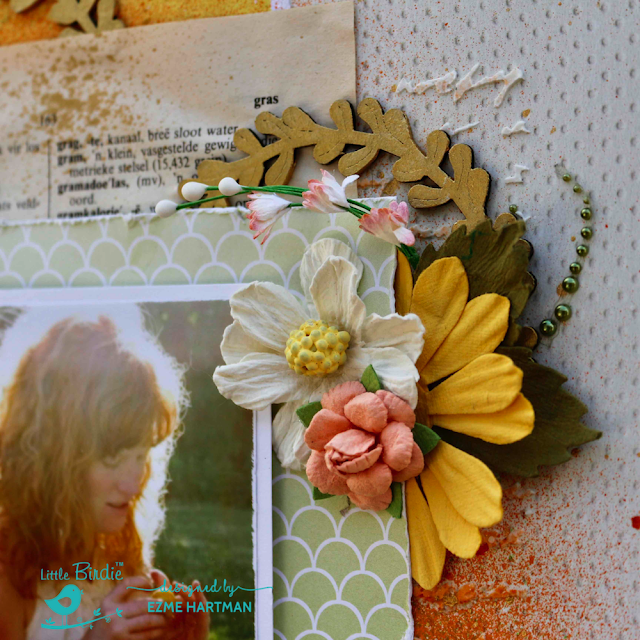 I just had to used it on this layout! To colour it I used the Metallic Wax Amber Gold. To complete the layout, I matt my photograph on a piece of the packaging, the colour matched perfectly. I layered a piece of LB Cheesecloth behind the photographs and adhered it to the background. 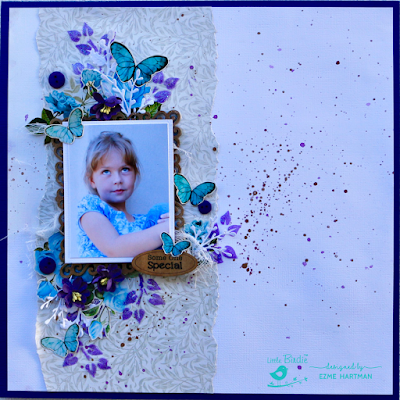 I embellished with flowers: Fairy Garden Amor Mio and Cornelia Grey, and some lace flowers. The sentiment is from "Expressions: Made for each other". 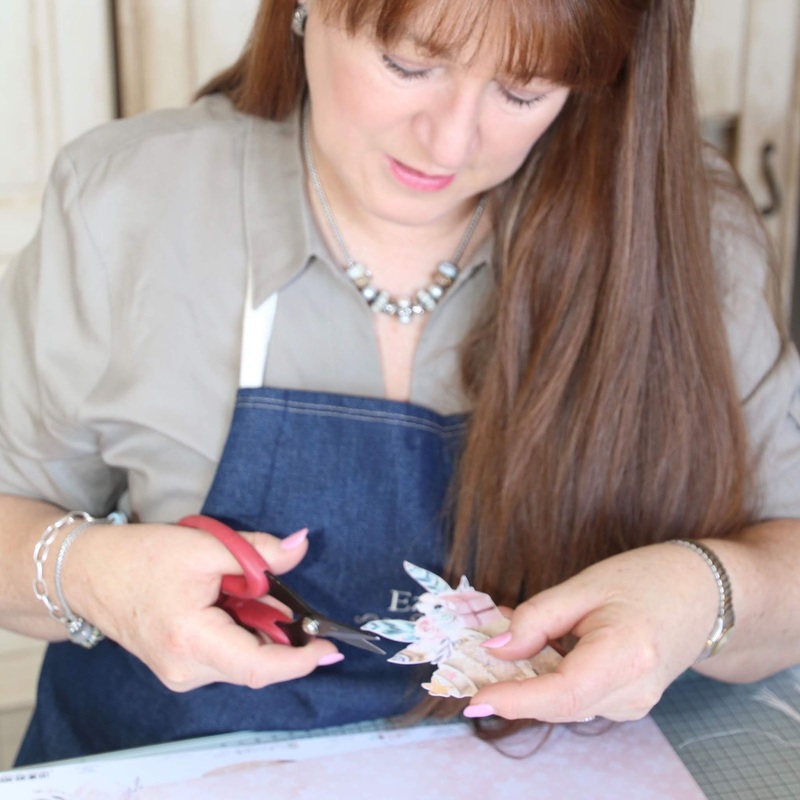 I hope you found some creative inspiration here and that you will try out some of these amazing Little Birdie products. And thank you for stopping by. 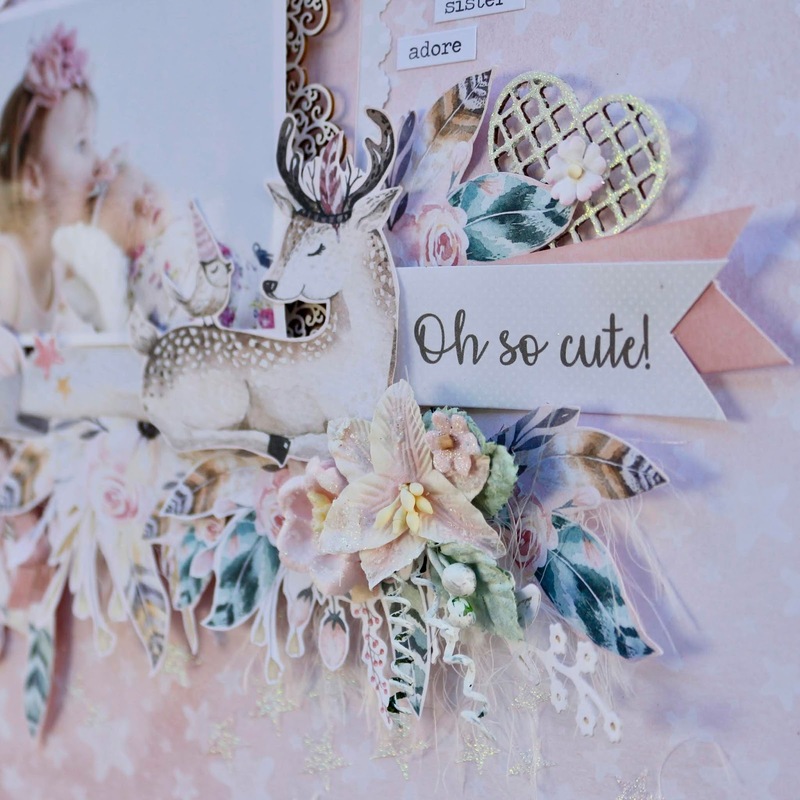 Today I want to share this lovely feminine pastel pink single page layout with you. The two sisters in the photograph are my two nieces, Isabella and Hailey, taken on Hailey's "New Born" photoshoot. I chose Piatek 13 papers, the Cute & Co collection because it is just so gorgeous! 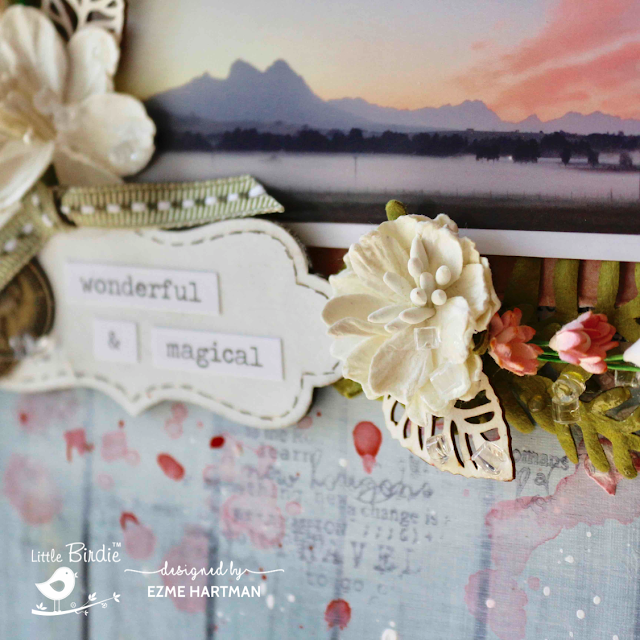 I painted the background with clear Gesso and stencilled small stars randomly across the page. 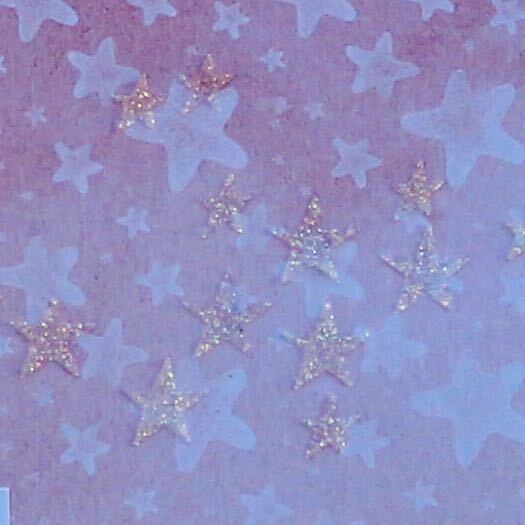 I used Little Birdie Sparkle paste and a homemade star stencil. 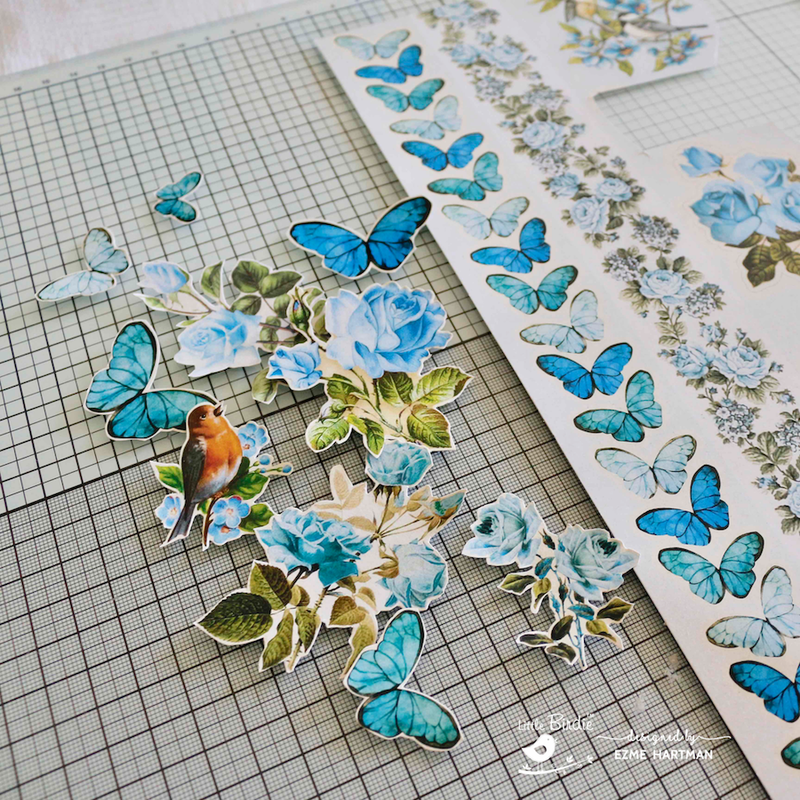 Then I fussy cut elements from the Cute and Co papers. I used white card-stock and the Botanical set from Couture Creations to create extra foliage. 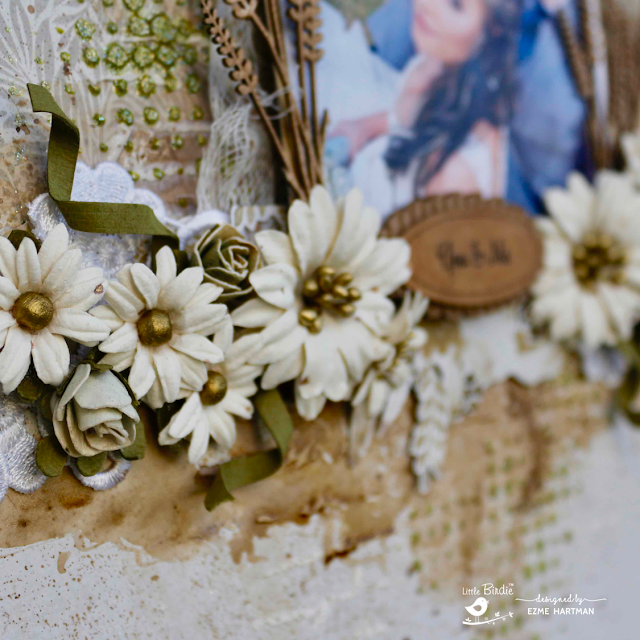 Then I layered the elements, flowers and chipboard to form an embellishment cluster. 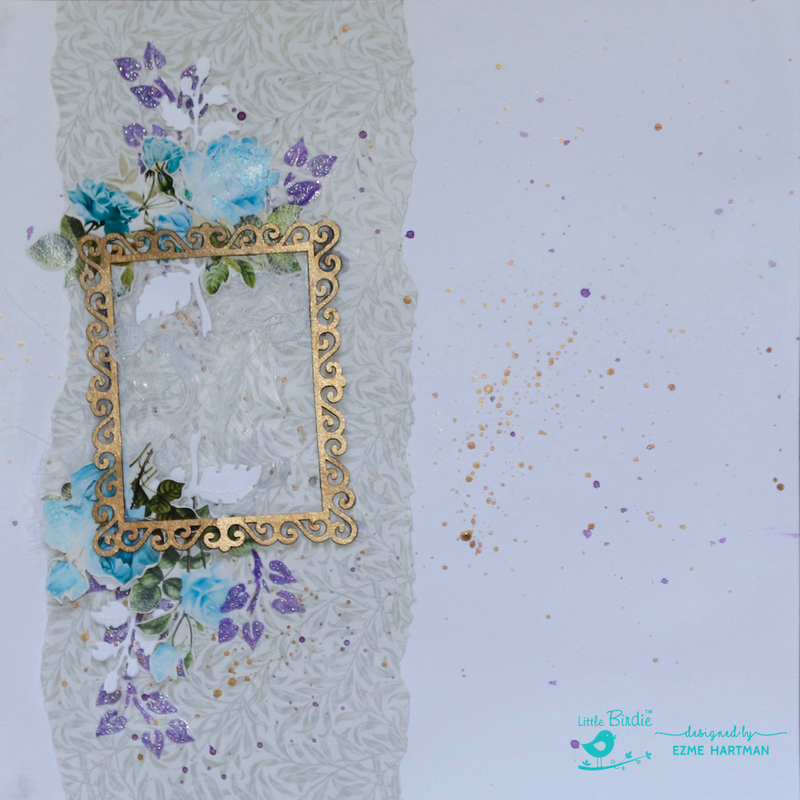 Finally I added the photograph, tucked in behind the deer and little bird. Here are a few close-up pictures. Couture Creations, Cut, Foil, Emboss die: Botanical Set. Thank you for stopping by today, I hope you could find some inspiration here. 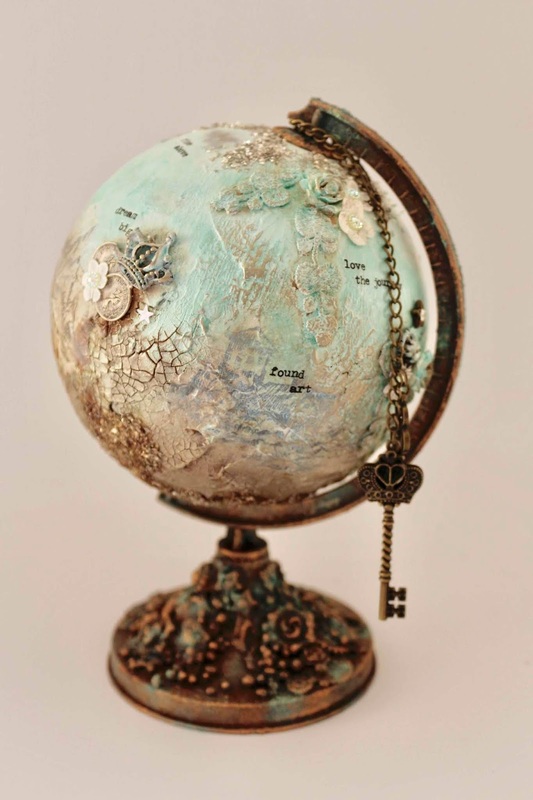 I have been walking around with this idea to alter something for a while and the other day when in PNA (stationers shop here) I saw a perfect little globe. I bought it there and then and couldn't wait to get home to start working on it. 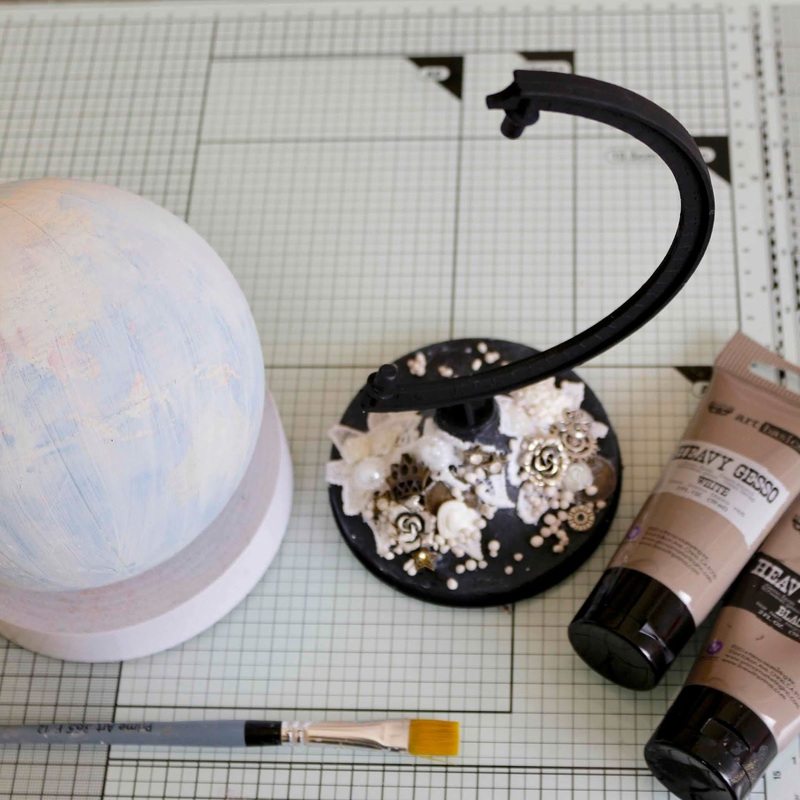 I removed the maps and other paper, leaving only a plastic ball and stand and covered it with Black Gesso. I adhered various elements with gel-medium and painted with Black Gesso again. 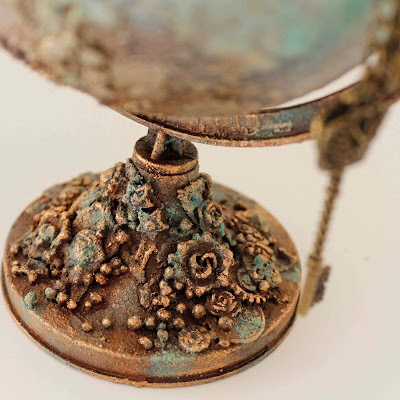 I wanted to create a patina effect on the stand. 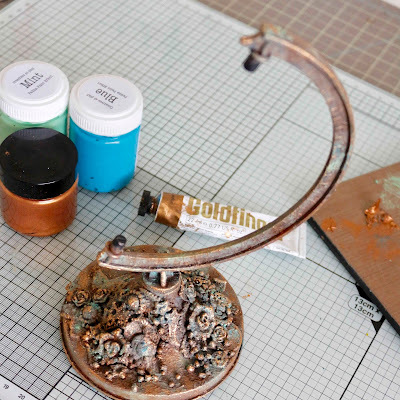 To to this, I used the Prima Marketing Patina Paint Effect Paste and a little Goldfinger Copper rub. 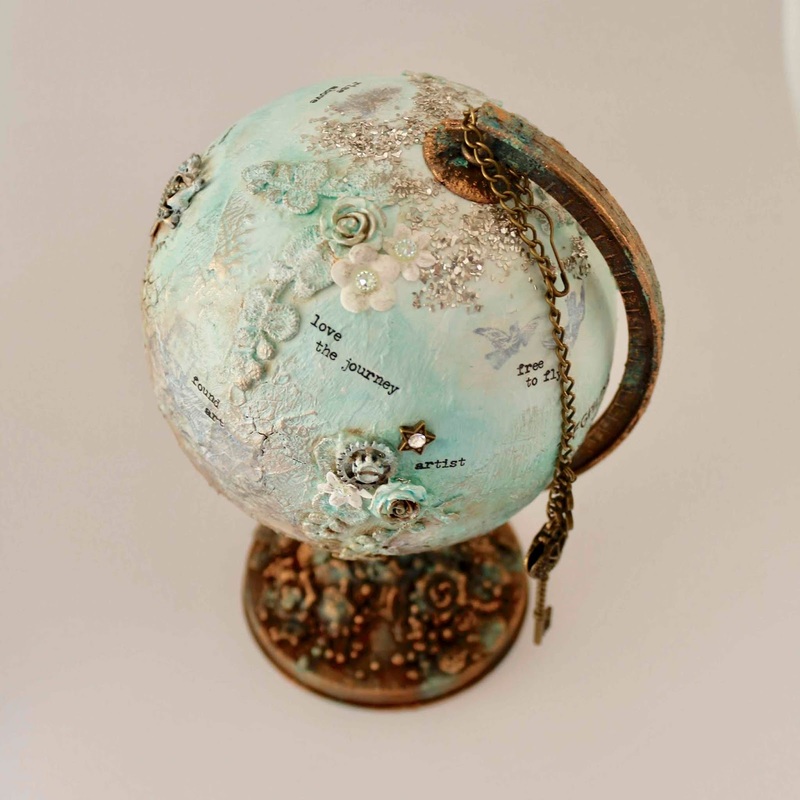 The globe was a process of layering : firstly with crackle paste then I adhered some embellishments that was painted. 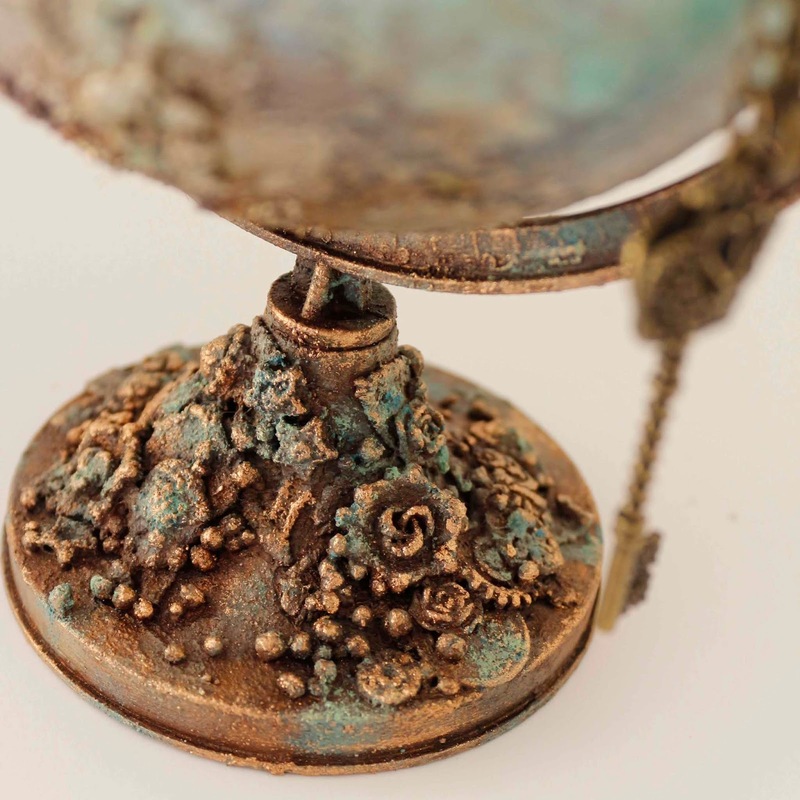 I used various paints, sprays and waxes to get the effect, with Glass glitter at the bottom. 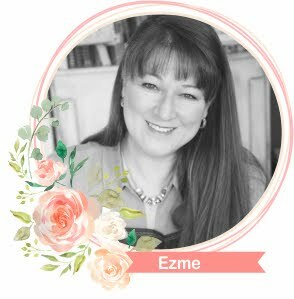 Thank you for stopping by, I trust you found some inspiration for creative play. 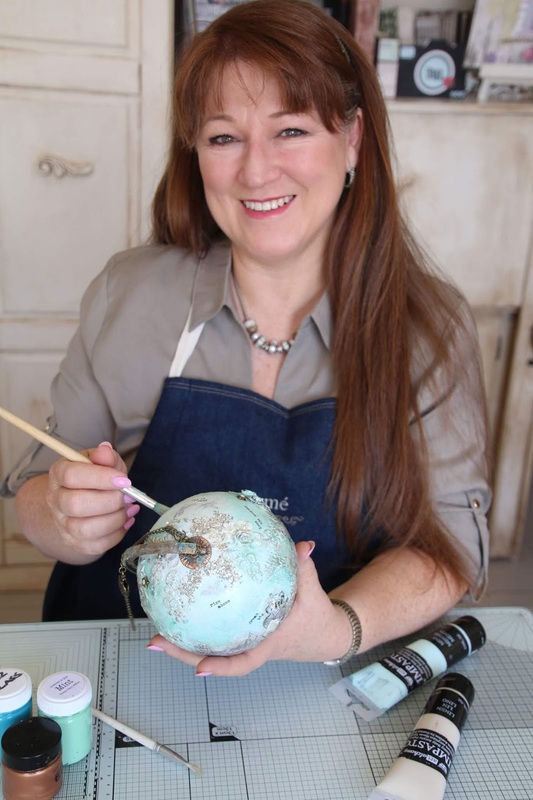 I've recently been asked by Tracy Schimper from "Art From The Heart" to design something with the new "Tranquility" Collection. 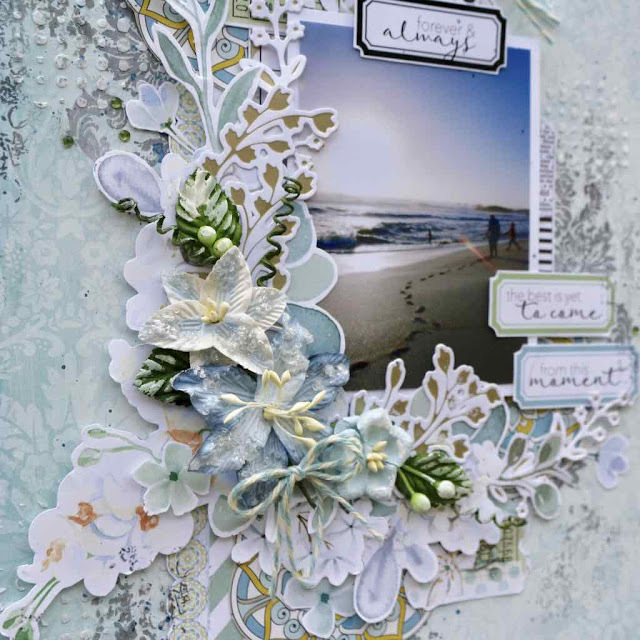 The paper range is absolute stunning and this photograph I took on the Yzerfontein Beach here in South Africa was the perfect choice. I loved creating this single page layout. 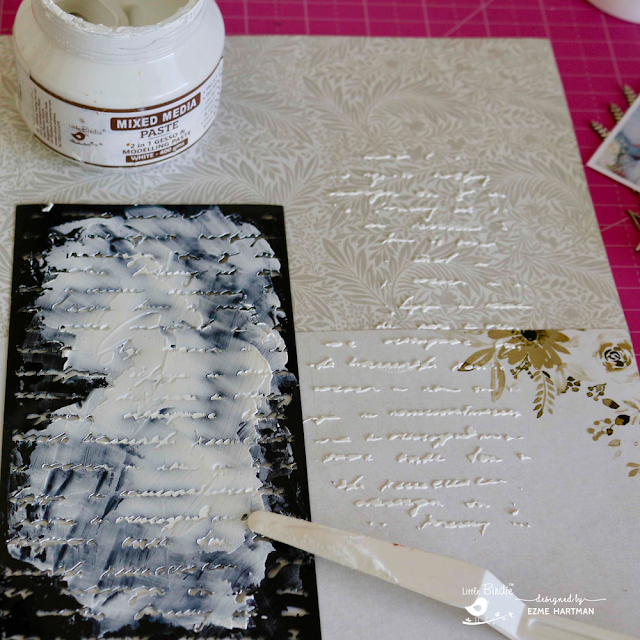 I used white gesso to tone the background down a bit and stamped randomly with a damask and Chinese writing stamp. 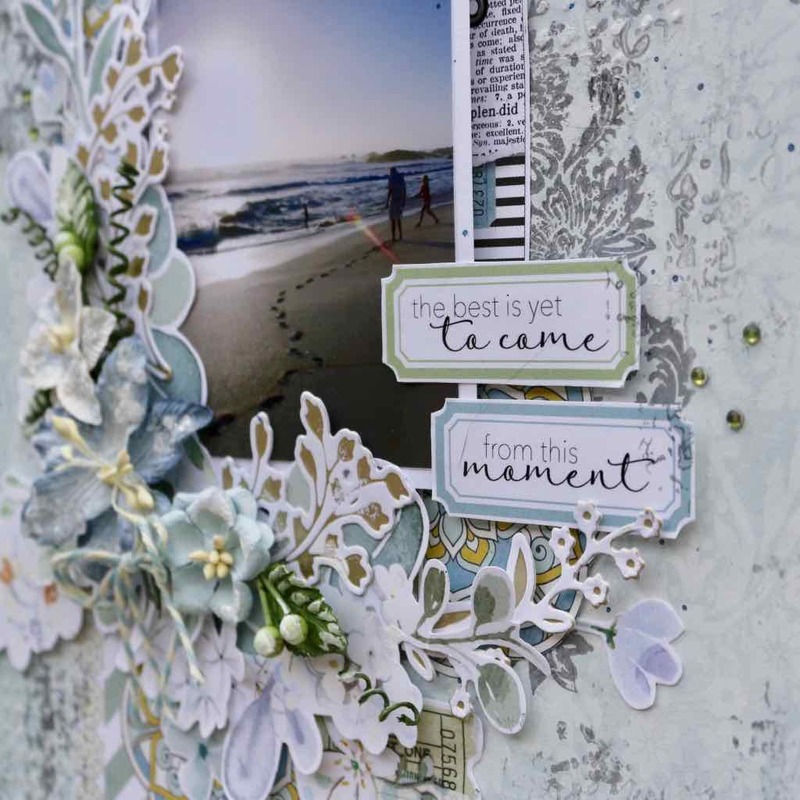 This created an layered effect. 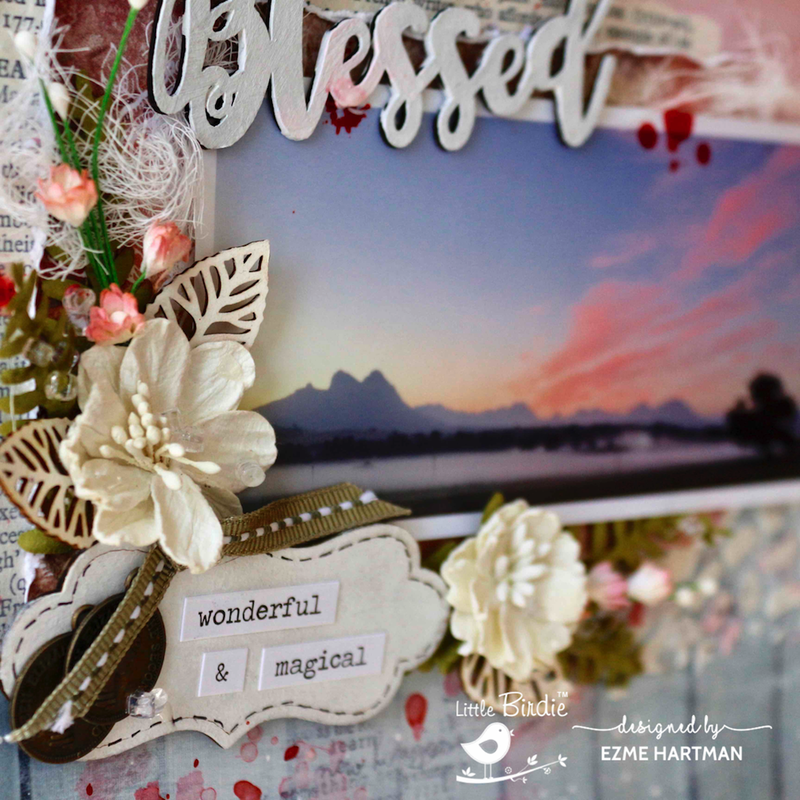 I fussy cut flowers and other elements from the paper sheets and combined it with flowers and GoPress&Foil elements to create this interesting cluster of elements. 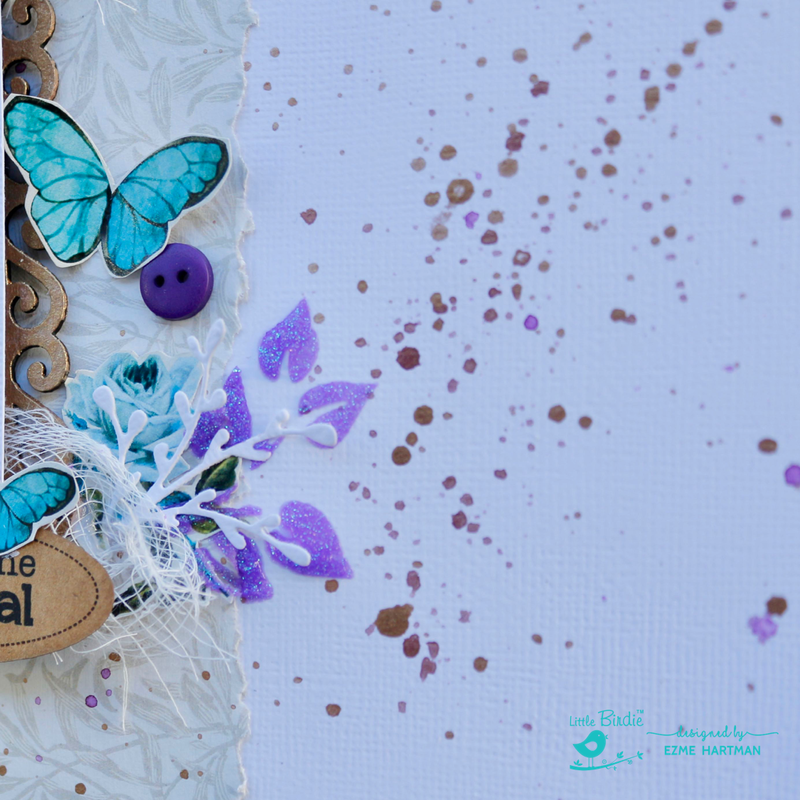 Thank you for stopping by, I hope this leaves you inspired to engage in some creative play! This time I really stretched my boundaries and worked with colour out of my comfort zone! I normally like to work with more subdued colors, but I thought : let me be adventurous and go for Yellow! 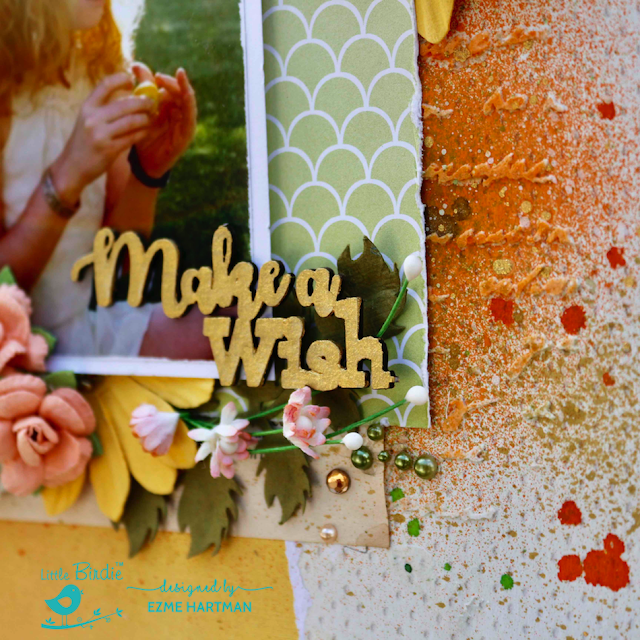 This photo taken of my daughter on her seventeenth Birthday is so whimsical and filled with glorious yellows and gold, perfect for this layout! 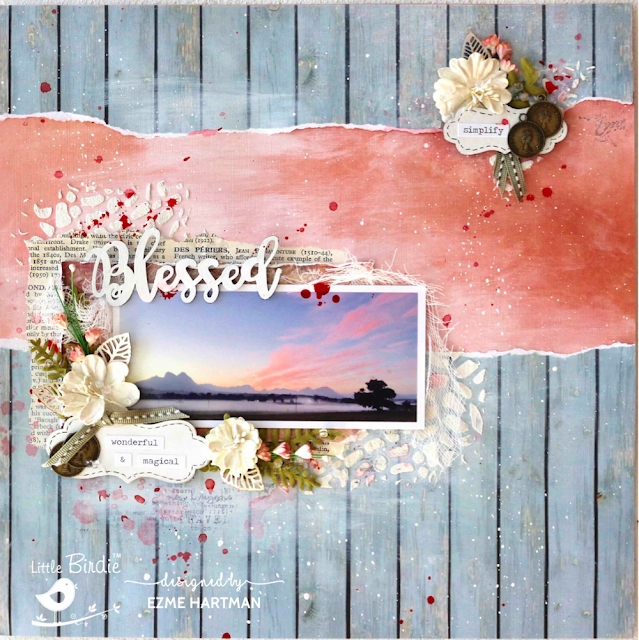 I created the background on paper from my stash and yellow paper from the Little Birdie Chevrons in Aquarelle Collection. I tore a piece and adhered it a little off side . I applied Mixed Media Paste through the LB Script Stencil. 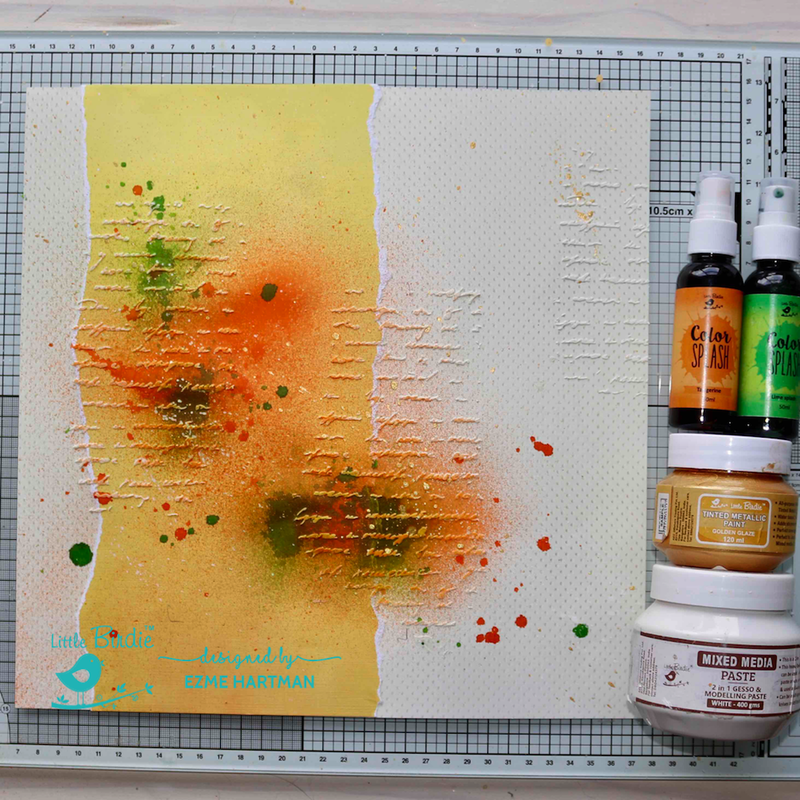 I sprayed Tangerine and Lime Splash Color Splash randomly. 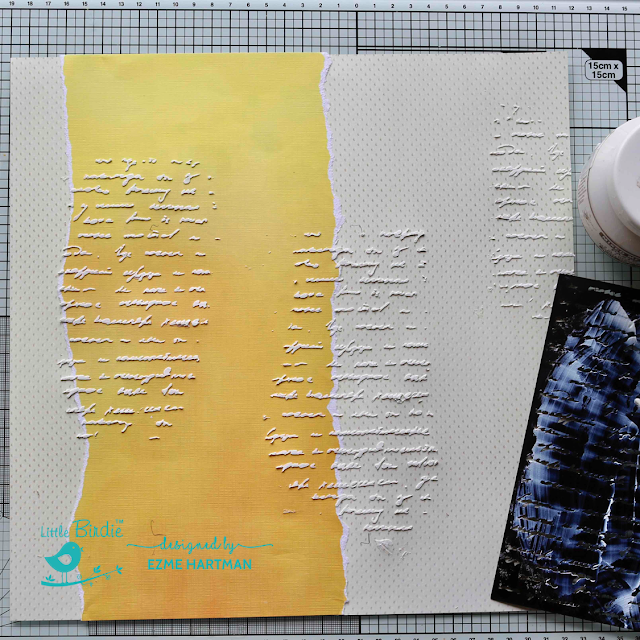 I also splattered with watered down white Gesso and Golden Glaze Tinted Metallic Paint across the page. The LB Chipboard is already primed therefor it is easy to paint the Golden Glaze Tinted Metallic paint on it. I really love the little wreath. 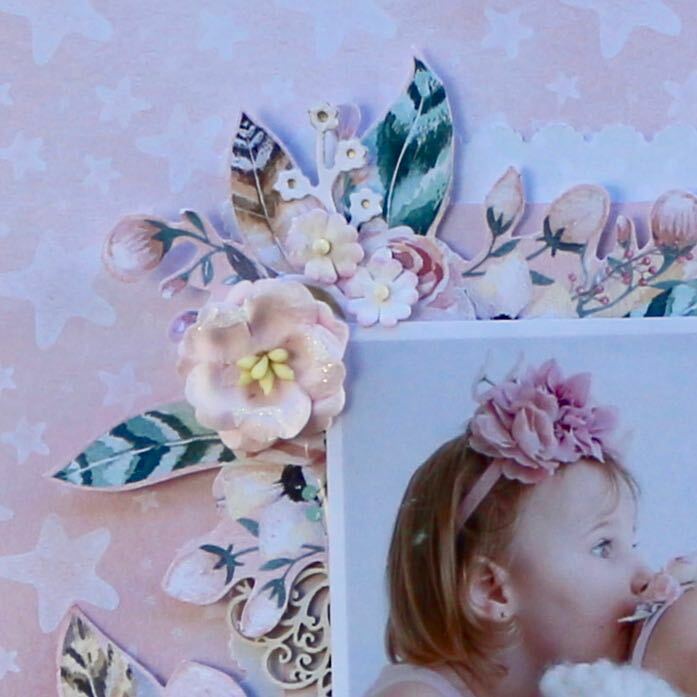 To create the layered effect behind the photograph, I used old book paper and an off cut piece of paper from my stash. I tucked the chipboard and leaves in behind the photo and added some leaves. finally I adhered the flowers and some self adhesive pearls. I hope this leaves you inspired to create and try out these gorgeous Little Birdie products! 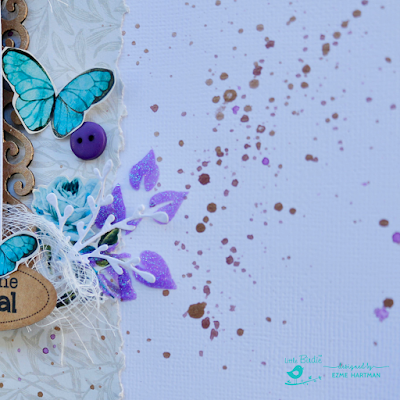 Until next time: happy creating! I’m back again with another layout. 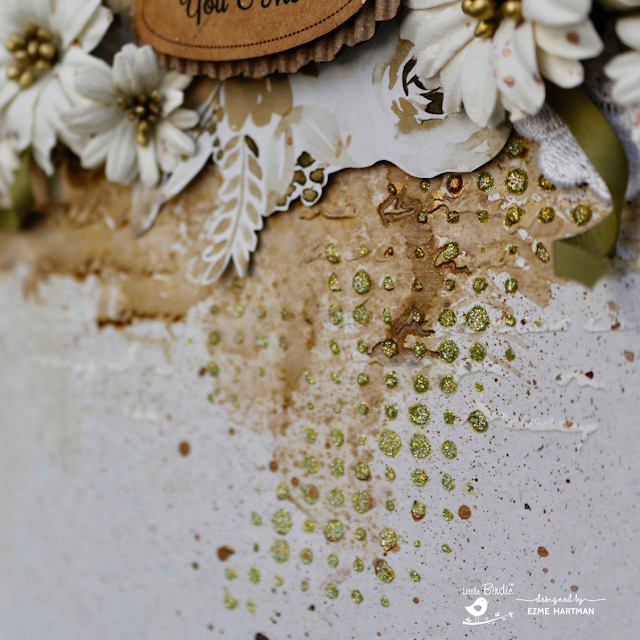 I really enjoy using the Texture Brew papers to create an interesting background for layouts. 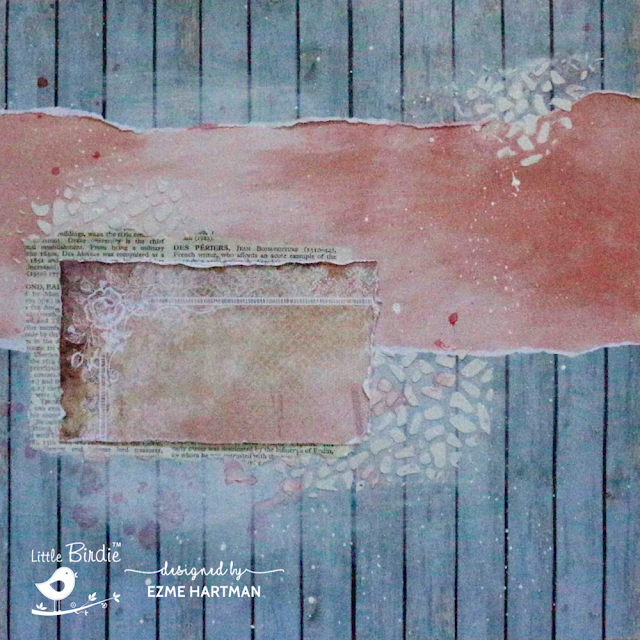 This time I combined it with a peachy color from the “Chevron in Aquarelle” paper pack. 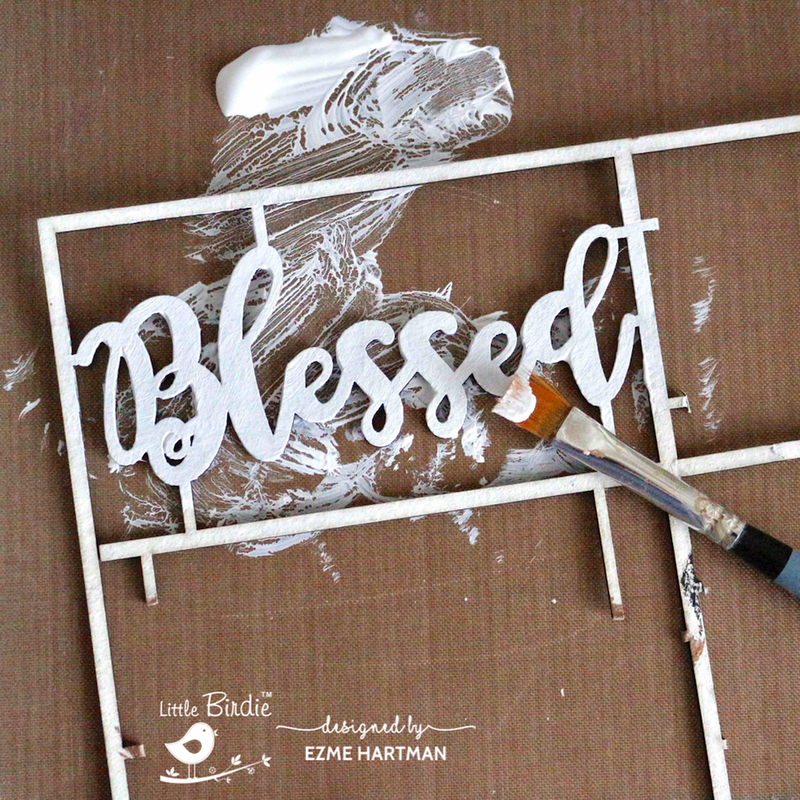 Although Little Birdies chipboard words are primed already, I wanted it whiter so I painted it with the white Gesso. I also painted the Cloud tags with white Gesso. 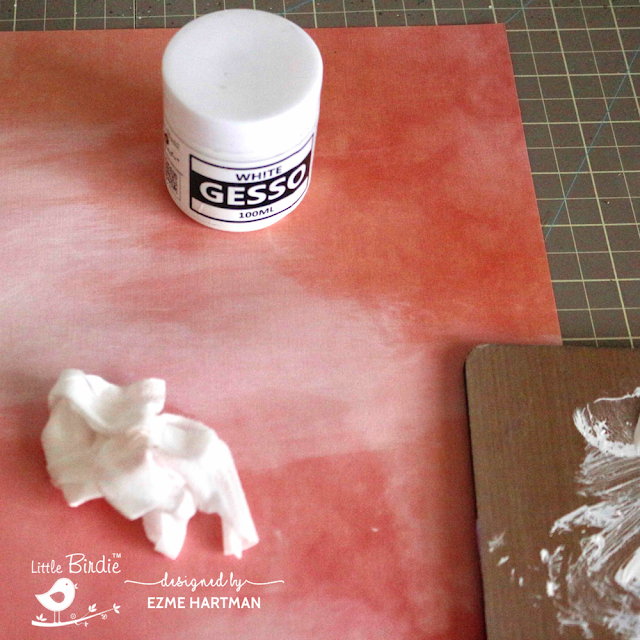 I used a Wet Wipe to apply the white Gesso to the background. I find it applies the Gesso more evenly. 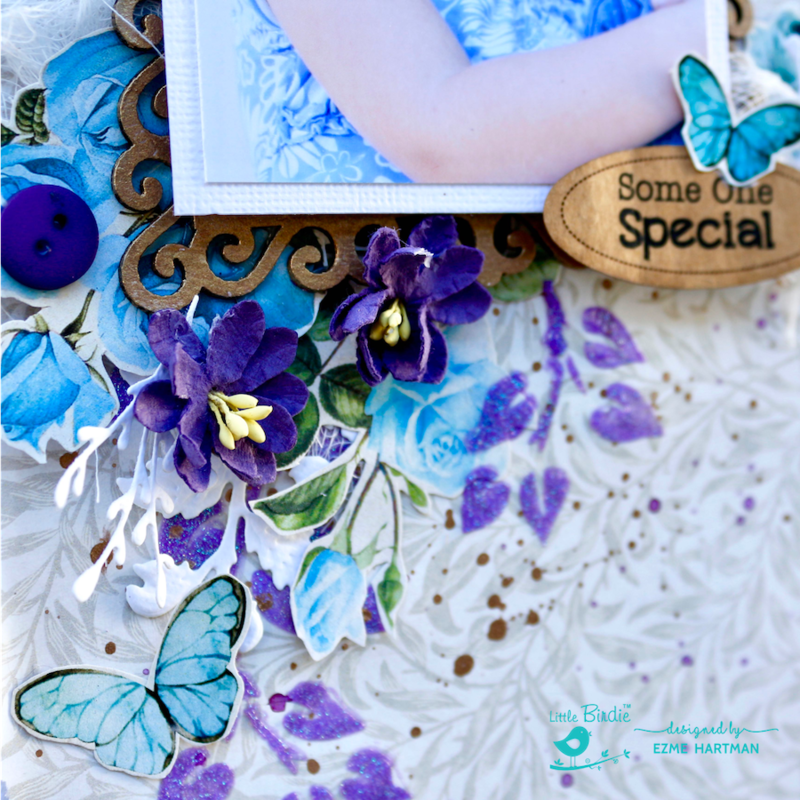 To create the background I tore 2 pieces of the blue-ish wood grain paper to leave a “window’ in the middle of the page. Again I applied Gesso with a Wet Wipe. I also stenciled with Grainy texture paste and the stencil. I splattered with the Berry Blast Color Splash and white Gesso, and layered some old book paper and leftover patterned paper where I wanted to place the photograph. 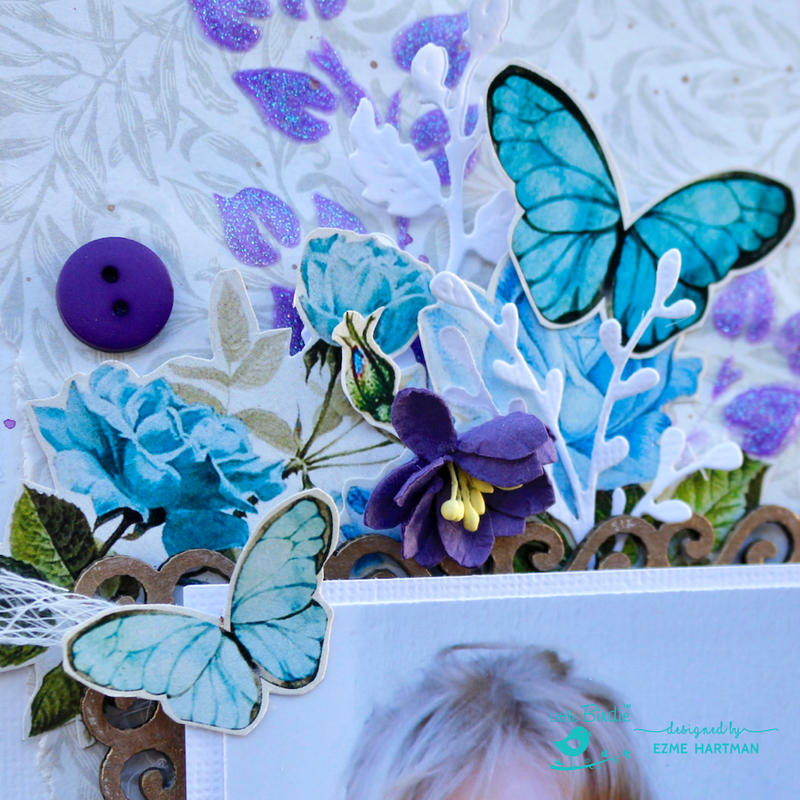 I created an embellishment cluster with a Little Birdie flower and Cloud tag and some other elements. I first adhered a small piece Cheesecloth before I placed the photograph, and created an embellishment frame around the photograph using flowers the title and the Cloud tag. To finish off, I stamped a little and splattered some more with the Berry Blast, I added some Crystals.